HOW TO CONTROL YOUR ANXIETY and HAVE A PERFECT WEDDING! Hypnosis can help YOU Program yourself to STAY CALM, super-boost your positive mind-set and handle any challenges. Easily! Amber’s Fears About Her Wedding Were Upsetting her. With the wedding three months away, Amber was asking for my help with hypnosis. “I know I am supposed to be excited about my wedding, but I am terrified”. She had always been anxious about presentations at school and now she was having panic attacks about her wedding. Not just the speech, which most brides are now expected to make, but with the eyes of the people on her every move over the entire wedding. What if she shook so much that she couldn’t walk down the aisle? She wasn’t sleeping, food tasted dry and she couldn’t swallow and she couldn’t concentrate on her work. Wedding tremors are not a problem just for the bride however, as Brett found out. He was fine when they set the wedding date a year ago but every day now loomed for him with terror. He was scared about to having to be the centre of attention for the day. Brett hated being “in the limelight”. What is the exact hypnotic procedure you need to help you to ensure you have a perfect wedding? You need a hypnotic audio recording that you can listen to every day leading up to the wedding. Dr Jan’s recording of “Stop Wedding Nerves And Have A Blissful Wedding” will help you program yourself to be positive and calm. You will have a fantastic set of positive thoughts in anticipation of a fabulous wedding day. You, your wonderful partner, your family and friends are all relaxed and happy, sharing this wonderful day. Everyone is there to help you celebrate and to celebrate your love for each other. They admire and support you and want you to have an amazing win in every way. They respect and love you. You both find it so easy and special to be the stars of the show. On your wedding day you create a moment of time that is joyful and happy in every way. A fantastic time is had by all. PS I am sure you want your wedding day to be unique and you want it to be special. 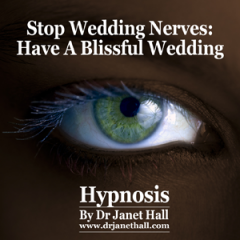 Why not email me directly on jan@drjanethall.com.au to arrange a one to one consultation by phone, skype or in the clinic so that we can design the hypnosis script for the ideal wedding for YOU!